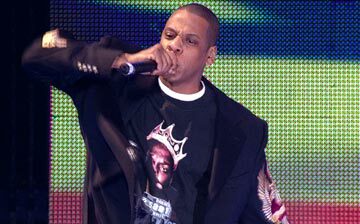 In November of 2003, Jay-Z 'retired' from recording, with a blowout concert at Madison Square Gardens. In the years since, he has amassed a fortune touring, most notably on a tour that with R. Kelly that recently imploded. Fade to Black is the film of that last concert. Jay-Z retired at the top of his game, after producing a string of albums. By all measures, he had many years of work left in him. He is renowned for his organizational skills, and when recording, he never writes anything down. It's all in his head. His concert at Madison Square Gardens was also important in that it was a chance for hip-hop to play at the Gardens, which usually denied such acts. Too bad Fade to Black is just not up to snuff. Jay-Z is a compelling performer who knows how to work a crowd. And while the music is good, unfortunately, his concert moves in fits and starts. It lacks a sense of continuity and momentum. Where many bands want to slowly build to a crescendo, Jay-Z plays a couple songs, then everything grinds to a halt. He then starts again, goes for a few songs, then everything again stops. It gets pretty annoying, and the main reason for this is the cavalcade of guest stars there to see him off. One DJ near the beginning of the film proclaims that the night is all about Jay-Z. Well, part of the standard business practice in hip-hop today is to fill an album with guest stars, most likely to widen the appeal and therefore help boost sales. Jay-Z raps with an impressive list that includes Beyonce, Missy Elliot, Beanie Sigel, Mary J. Blige, Twista, and Memphis Bleek. Oh yeah, and a bunch of them happen to belong to his record label. How convenient. Fade to Black is a film for fans only. Directors Patrick Paulson and Michael John Warren make no attempt to reach out to anybody else. They do not provide a single subtitle identifying anybody that appears on screen. Sure, most people can recognize Beyonce, Usher, P. Diddy, R. Kelly, and Missy Elliot. How many people can recognize Timbaland and ?uestlove? And how many of Jay-Z's fans will even know who legendary producer Rick Rubin is? Jay-Z goes to Rubin's house to record, and the two crow over each other for a few minutes, but unless someone knows who he is beforehand, they will just think he's some old fat guy with long hair. The fans are certainly into it though. They sing along throughout the concert, and yell wildly every time Jay-Z moves into one of his many hits or a guest star comes out. The stage is pretty simple. He either raps in front of some large monitors, or a band. For the most part, the behind-the-scenes sections of the film are pretty useless. Paulson, Warren, and Jay-Z shed little light on the creative process behind the making of his songs. The one interesting moment is a discussion about whether or not rappers should write about violence.